Jenna Banat is a volunteer in the Furniture, Textiles and Fashion department here at the V&A. In a series of three blog posts, Jenna is going to take a look at some examples of feather hats in our collection. Using inspiration from the objects within the Clothworkers’ Centre that I have had the fortune of studying during my internship at the V&A, this blog post will be looking at a selection of the fascinating feather hats within the collection. With this year’s Ascot just behind us, this selection also looks a little at the history of the event and at some stand out hats from its past. Ascot’s reputation is that of one of the most prestigious events in the racing year. The event has close links with the royal family and has taken over our fashion magazines/features to showcase the array of millinery masterpieces worn for Ladies’ Day. The milliner Frederick Fox attributes the survival of hat-wearing in Britain to royal patronage and to the tradition of race meetings. Edwards and Beyfus’ etiquette manual ‘Lady Behave: Guide to Modern Manners’ observed that in 1956, ‘Well-to-do people have been seen to wear the same dress twice, but they still wear different hats’. The Ascot Racecourse was founded by Queen Anne in 1711 and since that time, a further eleven monarchs have been patrons to the Royal race course. One of Britain’s finest milliners, Frederick Fox, was the youngest designer to make hats for the British Queen and also made one of the most celebrated hats known as the ‘flying saucer’ worn by Diana, the Princess of Wales to Ascot in 1985 and then again on the official royal tour of Italy in the same year. Coniston Hat, made by Frederick Fox, 2000. Museum number: T.33-2003. Fox opened his first millinery salon in London’s Brook Street in 1964. He designed classic styles and was particularly well-known for his Breton style hats, with upturned brims in all their variations, which were very flattering and combined femininity and timeless elegance. Hilary Clinton recognized this when she wore a blue velour hat by Frederic Fox for the day her husband was inaugurated as President of the United States in January 1993. The Coniston Hat is from Frederick Fox’s archive of hats donated to the V&A at his retirement in 2002. The hat is made of velvet, moulded into undulating folds which are permanently set to one side, giving the effect that a fast wind has just swished by the fabric. The design of the hat suggests the idea of speed and is named ‘Coniston’ after the lake where Donald Campbell broke the world land-speed record in 1967. 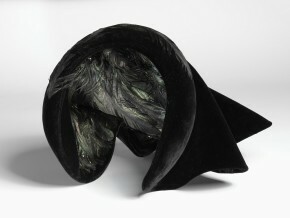 The hat is lined with bird of paradise feathers which give an iridescent sheen to the interior of the folds. Sir Frederick Fox retired from the millinery business in 2002. He was noted for his technical skill in making hats and his use of the highest quality materials. Following his retirement Fox returned to Australia and became a patron of the Australian Millinery Association. He passed away in 2013, aged 82. F. Fox, Interview with Emma Damon, April 1996, The Cutting Edge, 50 Years of British Fashion 1947-1997, V&A Publications (London: 1996) p. 138.